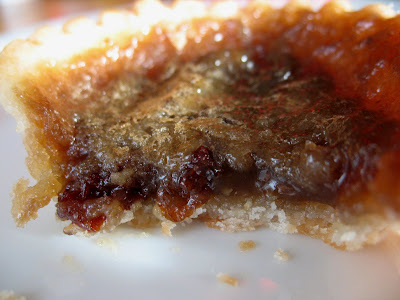 Nothing says holidays in my house like butter tarts. For you Americans out there scratching your heads, read about the history and what they are here. Sweet, full of raisins, a little bit messy to eat, these are scrumptious. I have to warn you, I do not make pastry from scratch. Instead I buy ready made tart shells, because it's just a whole lot easier. This picture to the left are my tart shells all ready to go in the oven. Also, these freeze really well! I like to eat 'em straight from the freezer, actually. Just be careful how you pack them. They do best if you freeze them on a cookie sheet first until they are nice and hard, and then pack them into an airtight container with a sheet of waxed paper between the layers. This recipe is from my mom, and I have no idea where it came from. Pre-heat oven to 400 F.Measure raisins into a bowl. Pour boiling water over to cover and allow to steep for 10 minutes. In a separate bowl, mix together brown sugar, corn syrup, salt, and vanilla. Drain raisins. Add butter directly to drained raisins and stir until butter is mostly melted. Add to sugar mixture and combine until butter is melted. Stir in beaten egg. 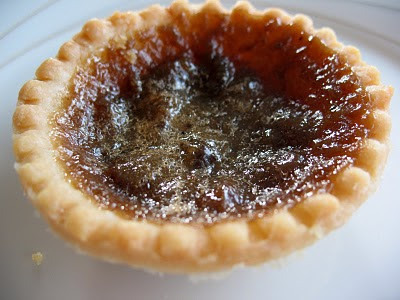 Fill tart shells 3/4 full and bake for about 10-12 minutes, or until pastry is browned and filling is browned and bubbly. Yummy! They freeze really well too. Makes about 12-14.